12:37 PM Important Update: Apple is live blogging it’s own event. With less than two hours to go before Tim Cook And Company take to the stage, the rumours are buzzing about what we can expect at this unbelievably hyped Apple Event in Cupertino, California. 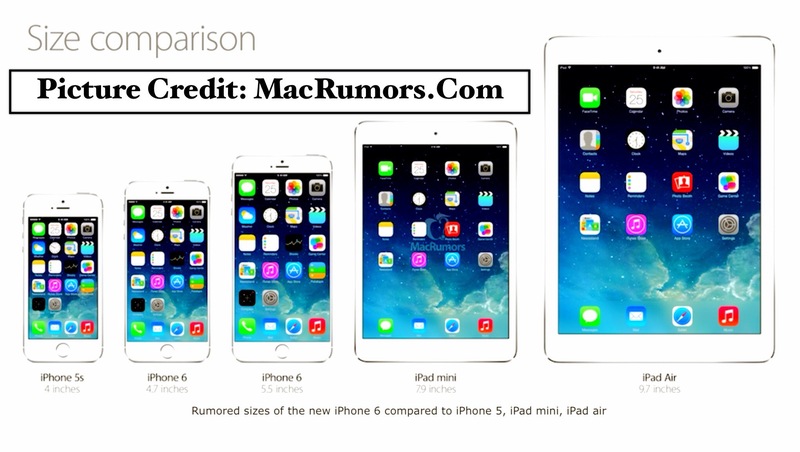 MacRumors designed a wonderful photo – pictured above – about the prospective dimensions of the new iPhone (s) in relation to the iPads. Looks pretty cool, doesn’t it? If all goes as rumoured, the iPhone 6 will be larger than its predecessor and that’s fine with me. It is not my main focus, however. I am more anxious to see and hear about the advanced technology included with this product. Near Field Communications (NFC) and an improved camera are appealing to me and I cannot imagine that either will be forgotten or acknowledged at this event. Enough with the horrendous low light resolution already ! And let’s not forget iOS 8 rocking your iDevices. I have waited long enough. I want it now. Last night, I had a dream that Apple released a 4-sided iPhone. It was pretty cool, actually, and realistic. Too bad I had to wake up. There were screens on both side of the iPhone and buttons for “who knows what” on the side. You could run two Apps at a time and interact between both. Why am I telling you this? Well, it passes the time before the Apple Event begins and affords a chuckle or two at your end. Laugh! I don’t care. At my age, nothing ruffles my feathers. You can watch the stream of the Apple Event on Apple.Com or on Apple TV. beginning at 1:00 PM Eastern. And check out the rumours and predictions atMacRumors.Com. 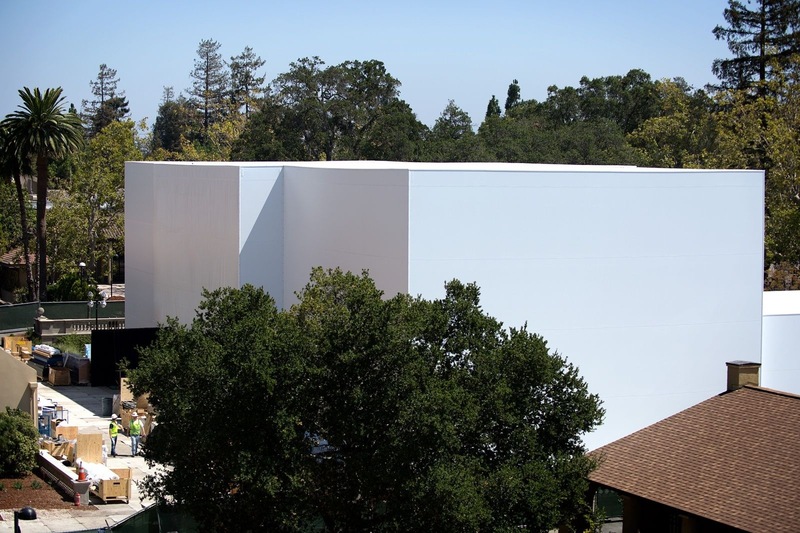 Does anyone out there think there is a full size Apple Television in that newly erected white building beside the Flint Center in Cupertino? Seems pretty large for iPhones and iWatches? GTG Rumor: Could there be an IWatch fashion show in that big white building? . I don’t what is going on over at Cupertino headquarters but, whatever it is, it is going to be huge when Apple unveils its new products on Tuesday. The security is so tight – 24-hour surveillance – and everyone associated with this event must surrender their phones before they enter the event mothership. It is hilarious and and admirable at the same time! “With less than 24 hours to go, security precautions for Apple’s big press event Tuesday have been taken to unprecedented levels. Apple has wired the entire event auditorium — the Flint Center for the Performing Arts — with a brand new, state-of-the-art security system to lock down access and prevent leaks. The auditorium is crawling with 24-hour security personnel. Anyone working at the massive show, from caterers to construction staff and technicians, is required to submit their phones to Apple’s security team. The phones’ cameras are being covered in special tamper-proof tape, which changes color if removal is attempted. “If it changes color, we’ll be fired on the spot,” said one person who is working at the show but asked to remain anonymous”. You can live stream the Apple Event on your iPad or computer or access the Apple Event App via your 2nd or 3rd generation Apple TV. Just so you know, I will be doing both. Why? Because that’s how I roll. Watches, phones, NFC technology – it is all mind-boggling. And what in tarnation is this mysterious white building erected for this event? Mamma Mia! Paranoia and mystery reigns!